Day 6 - This was a snorkeling trip on the Spanish Lagoon aboard a really pretty and comfortable sailboat called Tranquilo. The tour is a 5 hour sailing and snorkel trip to their private dock area on the barrier island that runs the length of Spanish Lagoon. This is an area where none of the other snorkel tours take you. 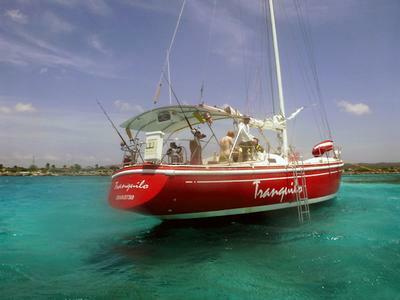 The Tranquilo is a bright red sailboat, approximately 40 ft. long, and is another sailboat built in Holland and sailed to Aruba by her owner. The captain of the Tranquilo, Anthony, grew up in Aruba and lives right across from the parking area of Mangel Halto. Anthony grew up in and around the waters of Spanish Lagoon, which is the area that contains Mangel Halto. His father originally sailed the Tranquilo, and now Anthony and his little buddy, Buster, a Jack Russell terrier who is totally comfortable on board the sailboat as well as the zodiac skiff. The Tranquilo sails from the marina across from the Renaissance in downtown Oranjestad. From there, you sail south past the Renaissance private island area and continue south into the waters of Spanish Lagoon. Just south of the Renaissance private area, there is a Frigate bird rookery, where there are dozens of Frigates nesting and roosting in the trees on the barrier island, and there are dozens of them wheeling in the air over the rookery! I have never seen a Frigate rookery before and it was really neat! The sail down the lagoon takes an hour to reach the mooring adjacent to the private dock area where you snorkel. The water in this area is just stunningly beautiful! After Captain Anthony and crew gets the boat moored, they give you some information and instructions and you spend an hour snorkeling the inside area of the barrier reef. It is a really amazing area, as it is an “estuary/nursery” area. If you take the time to really observe the details of what is happening on the reef there, you will realize that the water is teeming with clouds of “fry”! I got really excited to see this, because it means that the marine system there is very healthy and is producing abundant generations of fish there on the reef. There were so many different types of fish that we saw. Gorgeous Parrotfish, Wrasse, Yellowtail, Tang, Butterfly Fish and many others. The coral was healthy and abundant. After about an hour of snorkeling, we climbed out onto the dock on the island, then into the zodiac skiff. Captain Anthony took us out to the outer wall of the reef through a narrow channel in the reef. Once on the outside, deeper area, we did a drift snorkel behind the zodiac along the reef wall. The depth on this side averages 15 – 20 feet, so, it was great snorkeling depth. A bit further out from the island area, the reef slopes away to a depth of 50-60 feet and is really neat to swim over and just enjoy the deep blue color of the water in that area. Captain Anthony trolled slowly in the zodiac and we just followed behind the boat, keeping it in view. But, honestly, there wasn’t much need to look up, as Buster gets really excited and yaps at the schools of Yellowtail beneath the boat, and you can hear him, so, you know that you are on course. 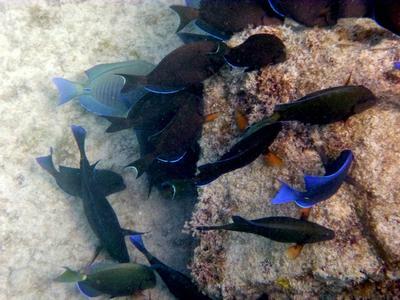 Again, the reef in this area is really beautiful and healthy with abundant schools of fish and marine life. One note on this drift, because it is on the outside, it does tend to have a bit of swell, so, if you get seasick easily, you might want to take some Bonine or something beforehand. We thoroughly enjoyed this trip and I was sorry to have to get back in the boat! After all of the snorkeling, once everyone is settled back on board the Tranquilo, the crew serves you a delicious lunch of homemade (Anthony’s mother’s) Dutch Pea Soup and sandwiches. It was a yummy lunch and filled the tummy nicely after 2 hours of snorkeling. Once lunch is done and put away, the Tranquilo heads around the end of the barrier reef to the waters on the outside of the reef and Captain Anthony puts out a couple of fishing lines at the back of the boat just to see what bites. The sail back to the marina is under full sail and, once again, takes about an hour to get back. Important details: This trip was $75.00/person. Allow enough time to get through downtown Oranjestad if you are staying on the north end of the island, as traffic can be really tough trying to get through the downtown district. For parking, plan to park in the parking lot marked for the Renaissance behind the Seaport Mall. Parking is also a nightmare downtown, especially weekdays when the Aruban Parliament and business offices are open. Thanks for sharing this story. 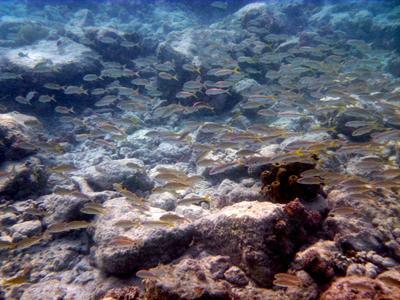 It's great that you get to snorkel both on the protected inside of the lagoon and the more exposed outside reef. This sounds like one of the best boat snorkeling tours you can do on the island. 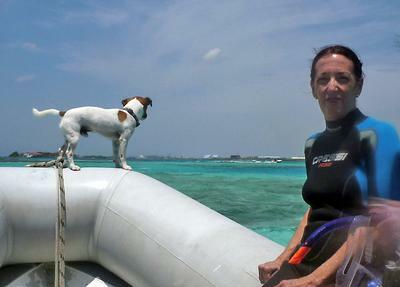 Our main Aruba snorkeling page has some more info about other boat tour options.